Horse shows, dressage, hunter/jumper events, schooling shows, gaming events, reining, team-sorting, extreme trail course and team roping events. The purpose of our organization is to develop and promote good fellowship among horse lovers, cultivate interaction and education among our members, and foster the welfare of our youth. Club activities include horse shows, dressage, hunter/jumper events, schooling shows, gaming events (timed events), reining, team-sorting, extreme trail course and team roping events. Horsemanship clinics to improve members' skills are held regularly. 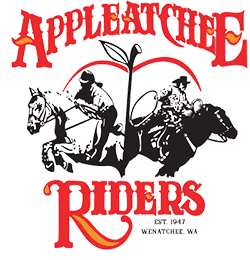 Appleatchee Riders hosts monthly 2-man and 3-man team sorting competitions and twice-monthly practices. Come check out this fast-paced, fun event. Opportunities for the young people in our community! Jumping, reining, dressage, general riding, and open showing for all levels. Interested in exposing your horse to cattle? Please join us. All members are welcome, beginners through advanced. Appleatchee Riders features 2 covered indoor and 3 outdoor arenas available for rent. All arena rental fees include a freshly groomed surface prepared to the event specification. During major events Appleatchee offers rental stalls. All stalls have access to electricity and water. All stalls are priced per day, per stall. This rate includes the initial bedding of one bale of shavings. All stalls are expected to be left clean. If it becomes necessary for Appleatchee Riders to clean the stall, a cleaning fee per stall will be assessed to the organization responsible for the event. We have 60 electrical hook ups available with 40 water hook ups. Camping fees are per day per hookup. There are 3 men's and 3 women's showers available in our fully modern campground restroom facility. Join us for an Event at Appleatchee! "The ground is always amazing and the races are well put together!" "Great place for horse events. Love the layout, parking and stalls." "Took the Pat Wyse Clinic this last week. Totally enjoyed the entire experience. New at horseback riding they welcomed me and was all very encouraging to help me learn. When I was ready to quit they helped me stick with it and I completed ✅ the class. Love the Pat Wyse Clinic and the people at Appleatchee Riding Thank you for making this a happen.."
"I had a great time sorting. Everyone was very nice and helpful." "It’s a very laid back atmosphere. Everyone it is very nice and very helpful. We look forward to participating every month!"